All transactions are safe and secure with a reliable history in online purchasing behind each of our associates. Buy the Retro I am McLovin t-shirt to own Superbad clothing and merchandise. These attractive seventies style McLovin t-shirts display Fogell's alias across the chest. The yellow text on the tee features an orange border. The design blends perfectly with the brown color of the apparel's fabric. 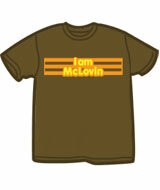 Behind the "I am McLovin" quote, is a striped design that adds to the retro appeal. This McLovin t-shirt is a great gift to pair with a movie poster or the drawings book featured below. See similar designs on other merchandise, including Superbad hoodies and hats. In addition to the Retro I am McLovin tee above, browse the Superbad Clothing Gallery for more apparel like men's and women's clothes, kids shirts or hoodies.